Firelink Shrine is the player's first destination in Dark Souls and Dark Souls Remastered. This ancient and crumbling shrine is used as a gathering hub and safe haven for many trainers, merchants and other story related characters. 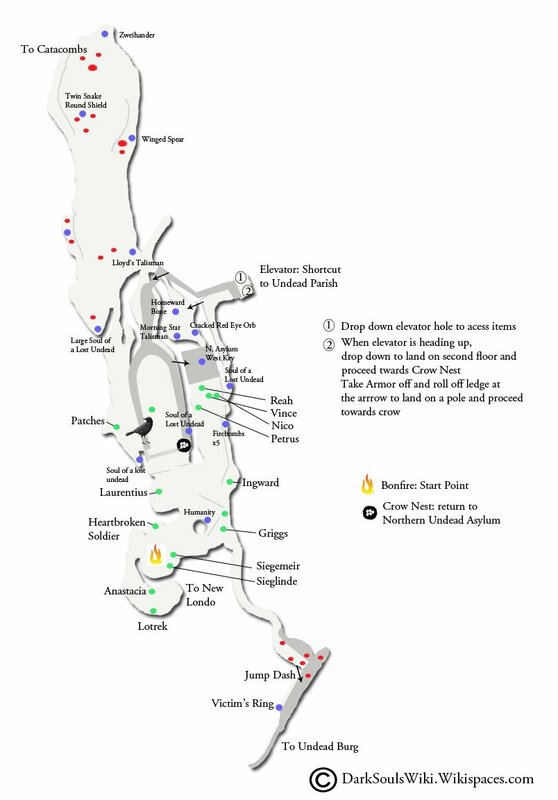 This central bonfire will be visited often, since it is also a crossroads for many regions and shortcuts. The first time you come here will be immediately following your escape from the Northern Undead Asylum - you'll be dropped beside a bonfire by the Giant Crow that picked you up at the end of the cutscene. From here there are many places you can go right from the beginning of the game, and even more if you chose the Master Key as your gift during the character creation process. Turn around and you'll see an aqueduct in the distance, which leads to Undead Burg. Sat next to the bonfire is a Crestfallen Warrior (He's typical of the type of NPC you'll meet in this game - talking in deliberately extraneous language and giving little in the way of hints as to what you should do next.) 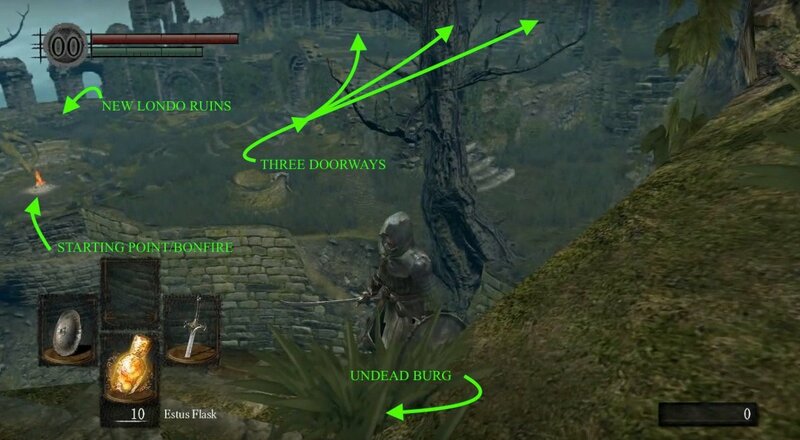 To the left of him you'll find stairs leading down to New Londo Ruins (and possibly Valley of Drakes, Blighttown and Darkroot Basin if you have the Master Key and a death wish). Anastacia of Astora is also found down these stairs behind some bars, but she can't talk and doesn't serve a purpose right now. In the doorway to the right of the Crestfallen Warrior you'll find three more doorways leading into some ruins: the one on the left leads to The Catacombs via a currently flooded ruin and a graveyard, the one in the middle leads to Petrus of Thorolund (a Miracle trainer and leader of the Way of White covenant). The right doorway takes you to can find some firebombs at the end of the passage. Upon first arriving you don't have any real alternatives other than to proceed to Undead Burg, since the enemies in all the other reachable areas are too challenging to deal with initially. However before proceeding to Undead Burg, there are plenty of useful items to collect here in Firelink Shrine. Near the bonfire you can find a corpse draped over it with Humanity. In the right doorway next to the Crestfallen Warrior you can loot some firebombs, as mentioned earlier. Drop down off the ledge that these chests are on and you'll find yourself in the graveyard mentioned earlier, where Skeletons will be reforming and readying to attack - it might be advisable to return to the bonfire if you're not confident in defeating them; take a left from here and go up the stairs to find your way back to the bonfire through the flooded ruins. Head back to the flooded ruins, out the exit on the left side of it and follow the walls on the left on the outer side next to the cliff edge to find another Soul of a Lost Undead precariously placed here. Go back to the side of the ruins with the path leading to the graveyard, go up the stairs on your right, into the inner balcony of the ruins and follow the walkway around to find yet another Soul of a Lost Undead. If you decide to go for the kills with the skeletons, it's advised to use blunt weapons (such as the Morning Star you found earlier) as with one hit you will temporarily "disassemble" the skeletons, making them a little easier to dispatch. 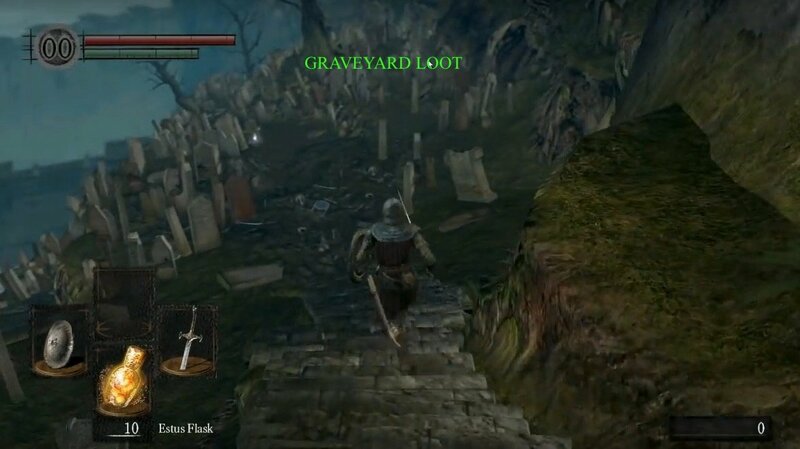 You've also got the option to pick up a few other helpful items in two of the surrounding areas, the Valley of Drakes and New Londo Ruins. While totally optional, these items will make the trip through Undead Burg and the next few areas a little easier. Head down the stairs next to the Crestfallen Warrior from the bonfire, past Anastacia of Astora and down the stairs to an elevator. Stepping on the middle of the platform will take you down to the New Londo Ruins. From here, head down the stairs and search down a small alcove to your left for a soul item. The Hollows that are spread around the area are harmless and won't attack unless provoked. Continue down the slope to your left through a doorway. You'll find a Hollow standing in front of a body holding an Estoc. Down the steps, a clay vase holds a body with two Transient Curses inside. Continue across the bridge in front of you over the water. Near the end of the second bridge, a Ghost will make its way toward you. You won't be able to damage it now, so run past it to the right and toward the wall. As soon as you come to the end of the small wall, double back around the other side through a small doorway. You should see an item in the distance in the water. Here's where you'll need to be quick: There's a thin walkway just under the water that leads out to the item. However, go through will spawn a couple of Ghosts in front of you. Push your way past them before they fully spawn while keeping your footing on the narrow walkway and grab the item, a Fire Keeper Soul. With your treasure in your grasp and the Ghosts ready to engage, leap off the cliff to your death to take the safer and easier route back to the bonfire. This Fire Keeper Soul can be traded with Anastacia of Astora to upgrade your Estus Flask, which lets you recover more hit points per use. If you chose the Master Key, you can explore the Valley of Drakes for a good shield and a sword that works well for faith-based characters. One Step At A Time - Once you've collected the items it's time to go to Undead Burg. From the bonfire head past the well and toward the cliff face to find a staircase that goes up by the cliff towards the aqueduct. At the top of the stairs you can expect a battle with two ; as you engage the first one, a second will likely jump down on or near you from the staircase, so be careful. After killing those two, it is generally easier to then go up the stairs to kill a Firebombing Hollow, an axe wielding Undead Solider, and another Undead Warrior will usually descend the next stairs up to the aqueduct. Using lock-ons in this area can be dangerous, so if you are having problems try fighting without them. Leap - If you head back down the stairs to the lower spot, there is an Armored Undead Solider with a shield. You'll see an item on the far side of lower level of the aqueduct. You can get it by jumping from where you encountered the shielded undead, onto the aqueduct. Once on the aqueduct, carefully make your way around the pillars until you reach the other side where you can pick up the Ring of Sacrifice. Make your way back around the pillars and jump back onto the cliff where you previously jumped from. Reaching The Burg - Continue up the two fights of stairs to find an entrance into the aqueduct, and a Soul of a Lost Undead at the end of the ledge. Once in the aqueduct, on your left you will find a dead end with Sewer Rat will be scurrying next to a corpse with yet another Soul of a Lost Undead. On the right is a corridor that you can follow and continue up the stairs on the left to access the Upper Undead Burg. You may notice a locked gate at the end of the corridor before heading up, which is unlockable later from Lower Undead Burg. Giant Crow - This crow will transport you back to the Northern Undead Asylum provided that you have access to the elevator connecting Firelink Shrine with the Undead Parish. Anastacia of Astora - Also known as the Ash Maiden, Anastacia is the fire keeper in Firelink Shrine. Located just below the bonfire down the stairs, she can upgrade your estus flask if brought a fire keeper soul. Crestfallen Warrior - This knight has become an undead and fears insanity above all, standing by the fire and resenting your travels. He will leave Firelink if you talk to him after Frampt appears in the nearby ruin, saying something about a horrible smell and doing something about it. He can later be found as a hollow near the first bridge after entering New Londo Ruins. Petrus of Thorolund - The first miracle trainer you find in the game. You meet him early in your journey, and he will give you a Copper Coin and the option to join the Way of White covenant. He will also offer to share his Lady's mission if you pay him an amount of souls that's determined by your current Soul Level. He also teaches you the Gesture "Shrug". Reah of Thorolund - The second, more advanced miracle trainer. A companion of Petrus, Vince, and Nico. She appears here after you ring the first bell of awakening but soon ventures into the Catacombs to find the Rite of Kindling, but becomes lost. In order to learn miracles from her, you have to rescue her from the Tomb of the Giants and then meet up with her again in Undead Parish, where she can be found praying at the altar. Vince of Thorolund - A companion of Reah, Petrus, and Nico. Becomes lost along with Reah in the Tomb of the Giants, at which point he will turn hollow. Nico of Thorolund - A companion of Reah, Petrus, and Vince. Becomes lost along with Reah in the Tomb of the Giants, at which point he will turn hollow. Griggs of Vinheim - This magician from the Vinheim Dragon School needs to be rescued from the Lower Undead Burg, and once he's back in Firelink he will then teach you some magic if your Intelligence is over 10. He also sells magic items, such as rings. Big Hat Logan - If you rescue him from the hanging cage in Sen's Fortress he'll next appear in Firelink where he'll sell a variety of more powerful spells than Griggs. You'll next meet up with him in the Duke's Archives. Laurentius of the Great Swamp - He's found trapped in a barrel in the Kitchen section of the Depths. Free him from this and you'll next meet him back in Firelink, where he'll serve as your first Pyromancy trainer. Kingseeker Frampt - He appears in the flooded ruin in Firelink Shrine after you rang both bells. This Primordial Serpent tells you your destiny and offers to break down Titanite into it's smaller components. For example, it converts Chunks of Titanite into Large Shards of Titanite. You can also "sell" him items for souls. (3) Humanity - Found on the corpse draped over the well. (6) Soul of a Lost Undead - (3) Found on corpses positioned throughout the ruins, (1) Found on a corpse near the stone waterway/aqueduct, (1) Found on a corpse just past the top of the stairs leading into the stone waterway/aqueduct, and (1) Found on a corpse inside the stone waterway/aqueduct. Just go in the door and hang a left, you'll see a rat, kill it and the corpse is behind him. (4) Cracked Red Eye Orb - Found in a treasure chest(*). (1) Morning Star & (1) Talisman - Found together in a treasure chest(*). (6) Homeward Bone - Found in a treasure chest(*). (4) Lloyd's Talisman - Found in a treasure chest(*). (*) The aforementioned treasure chests are in the ruins behind the bonfire. If you walk up into them you are presented with three archways. Take the middle one where you will find a rotund cleric, Petrus of Thorolund, and a collection of breakable urns. 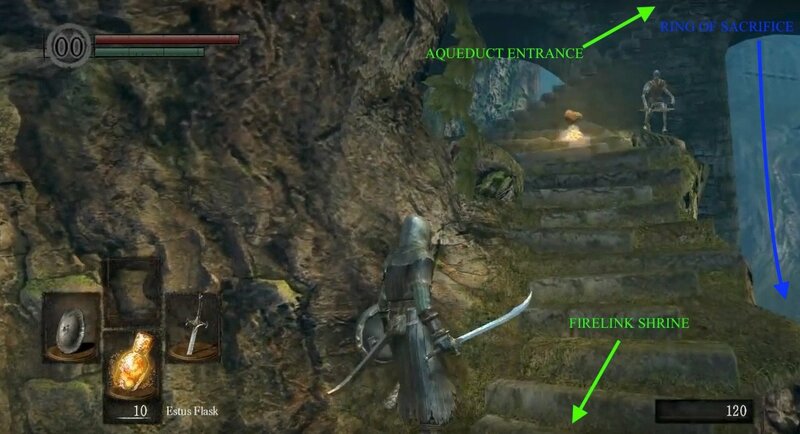 Take the stairs leading up just to the right of where the cleric is standing and then you will come to two dark square cut outs in the rock wall. These are elevator shafts for a shortcut that you will unlock later. For now just drop down the one of them and voila you've found the four chests. (2) Large Soul of a Lost Undead - Found on corpses in the graveyard. (1) Zweihander - Found on a corpse in the graveyard. (1) Winged Spear - Found on a corpse in the graveyard. (1) Caduceus Round Shield - Found on a corpse in the graveyard. (1) Binoculars - Found on a corpse in the graveyard. (1) Ring of Sacrifice - Found on a corpse under the stone waterway/aqueduct. (6) Firebomb - Found on a corpse in the ruins. 3rd archway. (1) Undead Asylum F2 West Key - found on the roof of the ruins, obtainable on your way to the crows nest. Inside the flooded ruin is an open chest, beside a statue of a maiden. Should the player be so unfortunate to drop a game breaking item, it can be retrieved from the chest, which will then be closed with the item inside. Salvageable items: Covenant of Artorias, Orange Charred Ring, Cat Covenant Ring, Darkmoon Blade Covenant Ring, Blue Eye Orb. Obviously the map was written by a idiot. All items are wrong, and you DO NOT go to the depths from the left shortcut. And did they really remove lightning spear in dark souls remastered? Who the hell wrote this map? Most of the items are named wrong, and some of their locations were switched.